A double review today. Two drams, both from the Scotch Malt Whisky Society. Now, I’m not a member… (shush!) but I managed to infiltrate their headquarters get my hands onto a couple of really delicious drams. 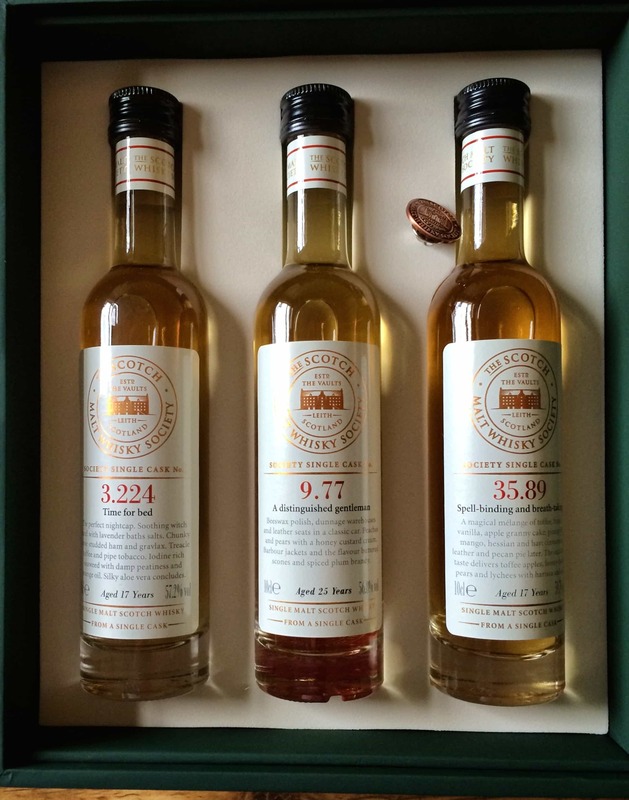 The premise of the SMWS is simple – sign up for membership and you’re able to purchase an exclusive range of highly regarded single cask whiskies from a range of distilleries. Simple! Only thing is, you don’t tend to know the distillery (well, unless you know all their codes). They bottle under curious codes and names such as “2.87 Satisfying as a butcher’s blade”. It’s not everyone’s cup of tea, but I find it all rather charming and interesting. First up was SMWS 35.97 Boozy Christmas Cake. 35 is code for Glen Moray, and .97 refers to the 97th cask. Colour: a dark, almost mandarin hue. On the nose: it’s very interesting, with blood oranges, vanilla, a touch of fresh bread and citrus. Dates, port – and then back to blood oranges once again. Almost a faint, vinegary acidic waft towards the end. In the mouth: oof! I don’t think I’ve experienced quite that rush of sweetness. It’s a full on, sweetly spiced slap in the mouth. Second time in and I know what I’m expecting. That really is tasty, but not for the fainthearted. Very hot on the tongue, peppery and oaky; seems almost as if it’s gone straight into new wood, but this feels more like a cask-finish effect on top of something more stately. Around that comes a missile of syrup and intense darkness – figs, prunes, dates, sultanas. A soothingly warm finish, but perhaps all in all a touch eye-watering. Secondly, one of my favourite distilleries – and one of the most underrated on the planet – the gentle giant of Caol Ila, and at 22 years old. Sorry, I mean SMWS 53.193 To bring a smile to every face. Colour: soft gold, barley. On the nose: peat bliss, although more smokey than sweet peat. This is a camp fire that’s been poked. Strong malted barley aromas with citrus and brine. On third or fourth sniff the sweetness does filter through and it becomes thoroughly pleasant and gentle. In the mouth: that’s pretty charming actually. All of the nose comes through into the mouth, and there’s a wonderful harmony of sweetness and briny smokiness. A little woodiness and only the whiff of spices. There’s nothing outrageous going on, not even that much to pick apart, but the core elements are done perfectly – with cracking balance. It’s one of those solid everyday peated whiskies, this – in fact, almost a great introduction to peated whiskies. Surprised that for an old Caol Ila there’s not more going on. When you like a distillery you start to have higher expectations of their offerings. Conclusions? Well, the Scotch Malt Whisky Society really know what they’re doing. These are two tremendously good reasons to join. I really should get my arse in gear and sign up. Samples part of an ongoing exchange with Whisky Rover. 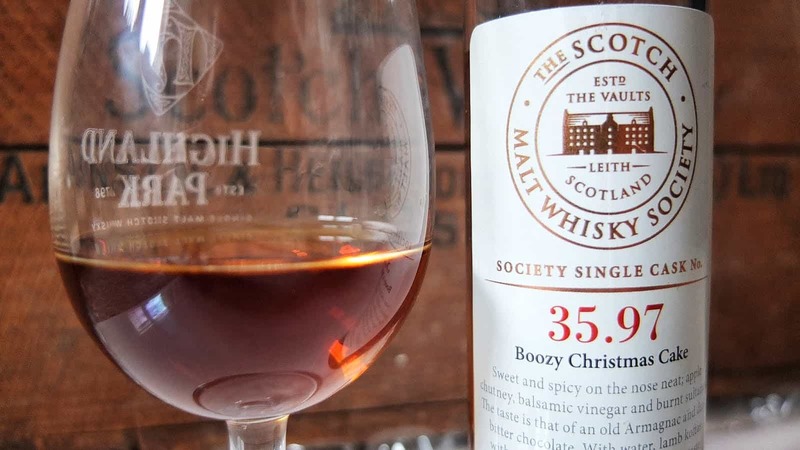 Inadvertently your review of the second bottle illustrates perfectly *why* SMWS sells their bottlings with a code rather than the distillery name. They’re not shy about telling you which distillery is which. The point is that they buy unusual, atypical casks and bottle them as single casks. Which means it’s almost no help to you to know which distillery it comes from. They don’t want you distracted by the label. For example, if 53.193 was sold as “Caol Ila, 22 yr” you would approach it with a set of expectation and they’d likely be very wrong: no standard Caol Ila will taste anything like 53.193. I can see that reasoning, certainly, though to be honest if someone served me up a Caol Ila of any vintage I would like to think I’d not barge in with a bunch of assumptions. Come to think of it, I’d approach any single malt, regardless of origin, with an open mind – knowing how different casks etc can have a radically different impact on flavour. One of the reasons I’m doing blind-tasting sample exchanges quite a bit at the moment is precisely that. No taste notes or suggestions of any kind. Though I know not everyone is like that. But I make no judgement on the SMWS’s reasoning – other than, as said, charming and interesting. Regulars will know I finally gave in and joined the Scotch Malt Whisky Society recently after years of deliberation. As part of your initial membership you..